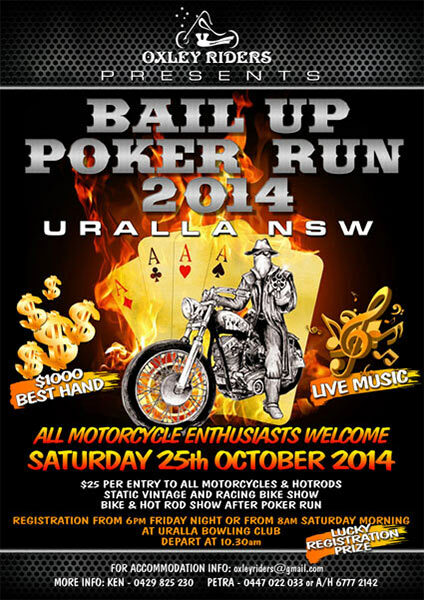 The Oxley Riders will feature a street parade, hold the 'Bail Up' Poker Run and a show 'n' shine on Saturday 26th October as part of the Thunderbolts Festival. Oxley Riders is a small, non-for-profit club based in Walcha, with members from Uralla, Armidale, Hunter Valley and Southern Qld. Their aim is to better the image of motorcycles and motorcyclists in general, encourage safe riding and to promote the lifestyle they enjoy from recreational rides.